Hood also has appliqued heart "cheeks"
Oink oink! Let's get a little piggy. No, we're not saying to go out and get a piglet of your own. We're saying you should get downright piggy with it. And it doesn't even involve stopping by the farmyard. Thanks to I Love Yumio, you're about to get your pig on! That's because, with these super cute pig Yumio pajamas, you're going to be one sharp-looking ungulate! 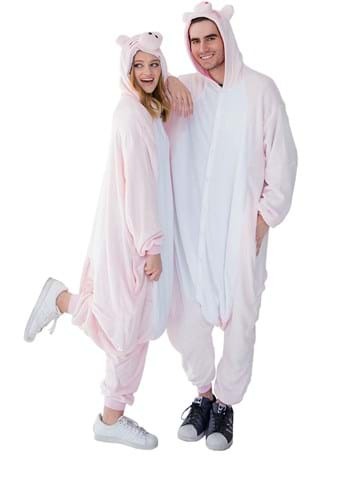 Not only are you going to look fantastic in these costume pajamas, but you're going to be oh-so super cozy, too. Now that straight up sounds like a winning situation. Getting piggy doesn't sound so bad now, does it? This adult pajama suit is an authentic I Love Yumio product. 100 percent polyester, it has a super soft flannel plush that will keep you warm and cozy. Button closures secure the front for easy on and off and it features pockets in the front. The hood features three-dimensional facial features for the ears and snout. And it has embroidered details with eyes and hearts for the finishing touches. Designed to be extra baggy and sized for adults, it's designed to fit most people between 5’ and 6’ tall, up to 240 pounds. Sure, wearing this pig Yumio is pajama set is a fantastic idea for any costume event, but frankly, we can't think of any reason that you wouldn't want to wear them all the time! Wear them at home for a comfy around-the-house look, or even wear them out anytime you want to make a big impression. Everybody loves a fun pig, so wear this Yumio out and about and you're sure to make some new friends!